Polyhedra contain information of great value. Their angles and proportions show us the Sacred Order. Their spherical symetry tells us about the Unity of Creation. All of the regular and semi-regular polyhedra give us points of reference that enable us to see the directions of space from the perspective of the sphere and thus recognize as directions the Heaven, the Earth and the Centre. Normally, polyhedra are presented resting upon their natural base, which is one of the faces. This doesn’t help us to see the alignment they have with the directions. The majority needs to be elevated and balanced on a vertex, others on an edge, for these six peripheral points to be aligned and oriented with the six directions. 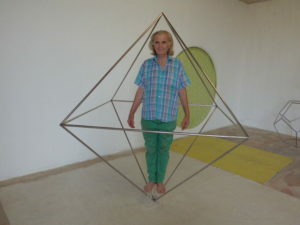 All pure geometry – the regular, semi-regular and the star polyhedra – have in common that they are ruled by this relation with the directions, from the most simple, the tetrahedron, to the most complex Rombicosidodecahedron and others. When we understand this relationship we can see that a simple change in position of some of the polyhedra makes the information contained in them more accessible. When we attune the polyhedra to the directions of space from the perspective of the sphere, they offer us aligned faces, edges or vertices, the 3 principal directions being east-west, north-south and heaven-earth. Also the 6 axis of the 12 half-directions are aligned. The simplest example to see this synchrony is shown to us by the hexahedron or cube, which has a square in all of the 6 directions, an edge in all of the half directions and a vertex in all of the 8 points where 3 principal directions are each-others neighbours. This order can be found in all regular, semi-regular polyhedra as well as derivates thereof.